This charming brick rambler sits on private .46 acre lot in the center of Oakton. Enjoy the natural setting on the large back deck that looks out on the beautifully landscaped back yard. Features include 4 bedrooms, 2 baths, wood floors, an updated kitchen with stainless steel appliances, Silestone counters & a sunny breakfast nook, delightful sunroom & a large lower level rec room with masonry fireplace. Directions: From Vienna: South on Rt 123 to Hunter Mill. Right on Hunter Mill. Left on Hunter Ridge. Left on Adel to #10393. From Toll Rd: S on Hunter Mill to right on Hunter Ridge. From Rt 66 N on 123 to left on Hunter Mill Rd, etc.. Enjoy a new design and excellent quality construction from one of Vienna’s oldest and finest builders, in the heart of “Downtown Vienna”. This delightful elevation includes Hardiplank, stone, and a charming porch feature. First floor guest bedroom/den with full bath. Six bedrooms & five full baths total. 9′ ceilings on all 3 levels. Designer kitchen opens to a fabulous expansive great room with gas fireplace & wall of windows. Coffered ceiling master bedroom with extra large walk-in closet & luxurious master bath. Basement will be finished to include 6th bedroom, 5th full bath & rec room. Madison HS Pyramid. Directions: From Vienna Metro: I-66 to Nutley Street; Right on Tapawingo; Left on Cottage. Or from Tysons: Maple Avenue to Left on Center Street S, Right on Locust Street, Left on Cottage St to #204. 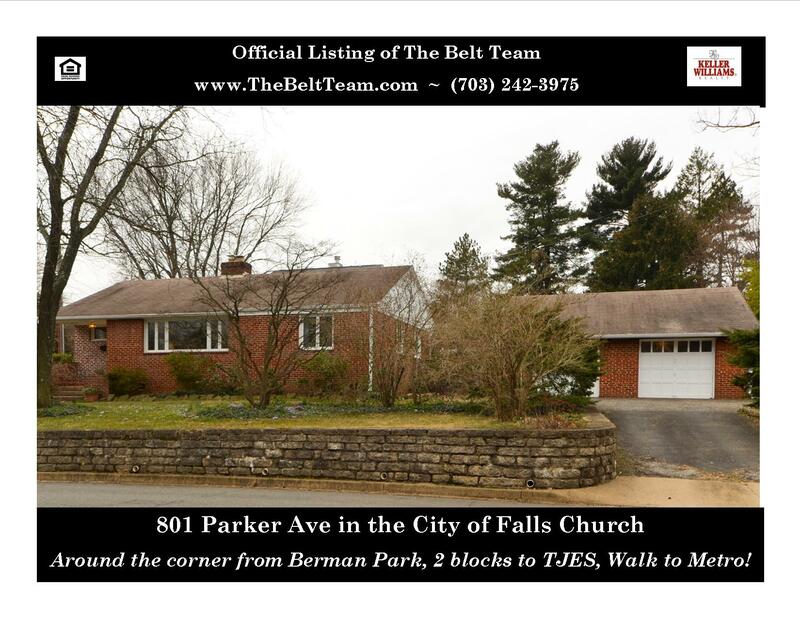 $585,000 – 801 Parker Avenue in Falls Church – JUST LISTED! LOCATION, LOCATION, LOCATION! 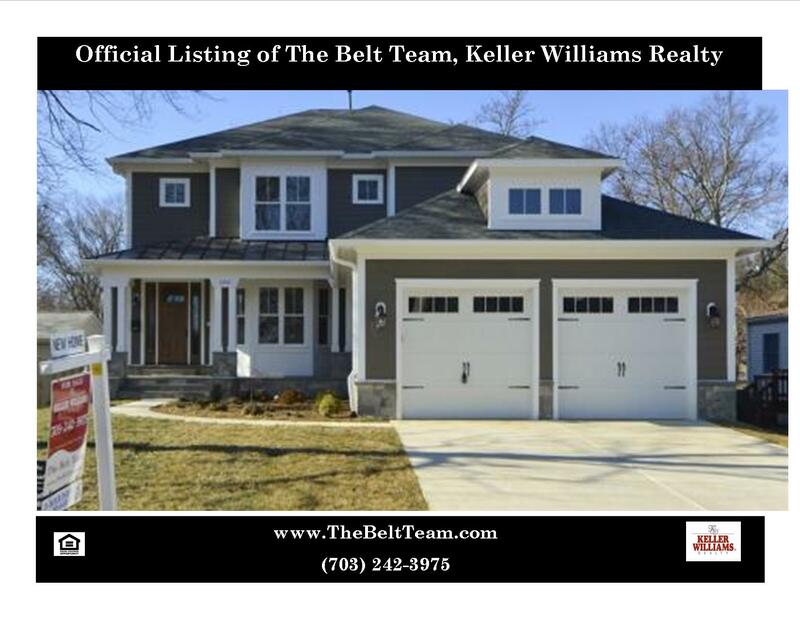 So close to it all….downtown Falls Church City, Farmers Market, Metro & Parks. Walk to TJ Elementary. Beautiful lot. Light & bright & recently painted. Features include 2 masonry fireplaces, a cozy second living room/family room, updated insulated windows, a private rear patio, an oversized separate garage (can be a 2 car garage) and extra storage. You can beat the Falls Church city lifestyle! $1,199,000 – 18511 Barton CReek Place in River Creek (Leesburg) – JUST LISTED! Beautiful Grand Botticelli model in sought after River Creek! Located on a rare private, wooded lot. Features include 6 bedrooms, 4.5 baths, refinished hardwood floors floors, curved oak staircase, custom molding & built-ins, gourmet kitchen with upgraded appliances, luxurious master suite, lower level rec room, custom window blinds/coverings throughout. Plus a 3 car garage, custom deck, porch and a patio with built-in grill & cooler! Sneak Peek In River Creek! We have a brand new listing coming on the market soon in River Creek and we’re giving you a Sneak Peek! This “Grand Boticelli” by Renaissance has a spectacular and rare wooded view and features approximately 6,800 square feet on three finished levels, including 6 bedrooms, a three car side-load garage, custom desk and porch, slate patio with built-in grill and cooler! 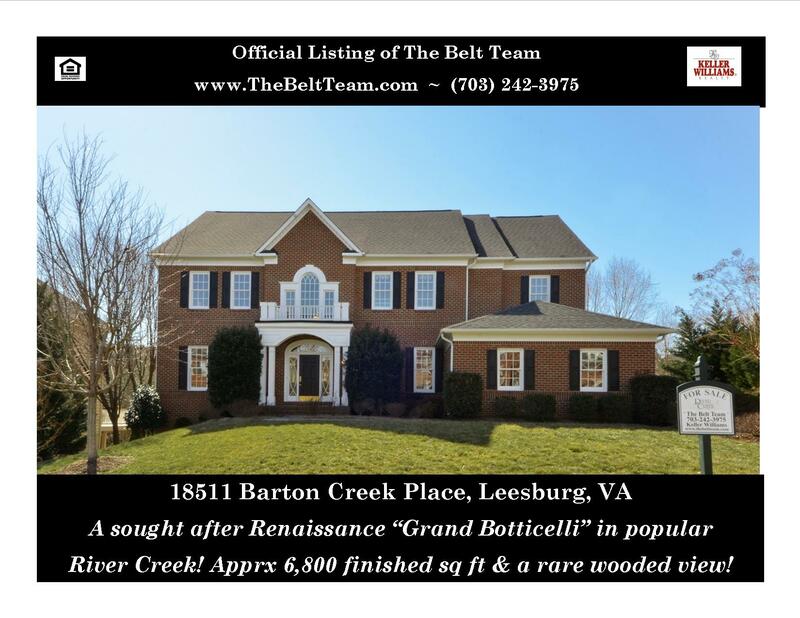 Call (703) 242-3975 for more info about this gorgeous River Creek home! Beautiful end unit 2 car garage townhome. 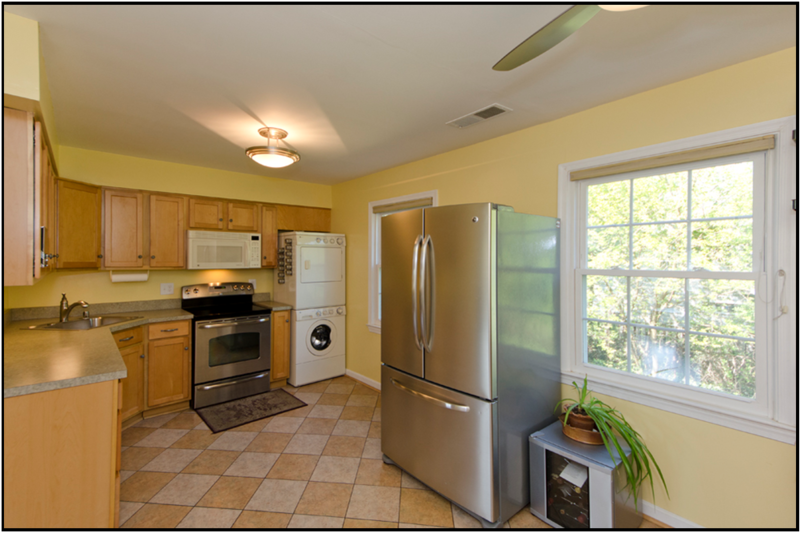 Enjoy a light filled gourmet kitchen & breakfast area that open to the spacious family room. Living room & dining room with 3 piece crown molding. Large master suite with walk-in closet and spa-like bath with Jacuzzi tub. Convenient upper level laundry. Fully finished lower level features a rec room with gas fireplace, full bath & French doors walk out to back yard. We have LOTS of listings still coming on the market this Spring & Summer. Let us know if you would like to be on our PRIORITY NOTIFICATION LIST so that you can find out about listings BEFORE they hit the market!